The Blue Ridge Parkway makes its way through the heart of Virginia&apos;s Blue Ridge Mountains. At 469 miles, this scenic drive winds along the Blue Ridge Mountains and offers visitors the opportunity to enjoy some of the best mountain views in the world. The Parkway is operated by the National Park Service and is the most visited unit in the National Park System. Travelers can take the Parkway north out of the Roanoke Valley and make their way to Shenandoah National Park and Skyline Drive or south toward Great Smoky Mountains National Park and Grandfather Mountain in North Carolina. The Blue Ridge Parkway also connects you to interesting locations in Virginia&apos;s Blue Ridge. The Parkway is only a 10-minute drive from Downtown Roanoke and there are eight different entry points to this world-famous road throughout the region. When traveling on the Blue Ridge Parkway, visitors have the opportunity to enjoy a variety of experiences, including Mabry Mill - one of the most photographed spots on the Parkway and an icon of the region, as well as the Peaks of Otter. Take a look at this video to see what it&apos;s like to enjoy fall colors on the Blue Ridge Parkway in Virginia&apos;s Blue Ridge. 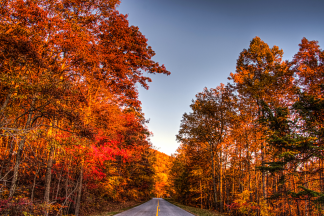 See the stunning fall colors along the Blue Ridge Parkway in Virginia&apos;s Blue Ridge! The footage was captured on Sunday, October 25 between Mileposts 130 and 121. The following resources can help you plan your time on this historic landmark that has been named "America&apos;s Favorite Drive." 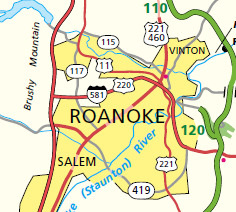 Navigate your way along the Blue Ridge Parkway using the map below or this Roanoke Valley Parkway Map, which includes the key points of entry to the Parkway from Virginia&apos;s Blue Ridge. Take advantage of the Interactive Map and other resources on the Blue Ridge Parkway website to enhance your drive. Check out our Blue Ridge Parkway Biking page for learning more about the ways you can enjoy America&apos;s Favorite Drive on two wheels! 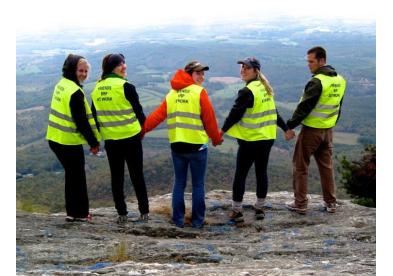 See a complete list of hiking trails on the Blue Ridge Parkway in Virginia. Due to occasional construction projects and inclement weather, portions of the Blue Ridge Parkway are forced to close. Fortunately, the National Park Service maintains updated information about closures on the Parkway on its website. 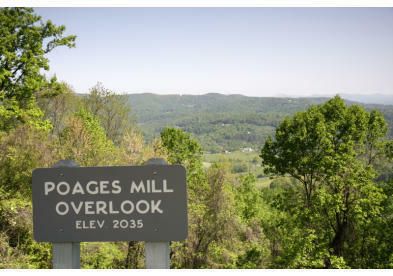 Enjoy beautiful views around every turn along these amazing scenic drives in Virginia's Blue Ridge!